by Ewald Engelen, Universiteit van Amsterdam On Wednesday evening, 25 February, a group of approximately 1,500 students marched towards the main administrative building of the University of Amsterdam, on the Spui, smack in the middle of the old city centre. Two days earlier the students had been forcefully removed from another university building nearby, which was in the process of being sold off to a real estate developer who was to transform the beautiful art deco building into a private club for the rich and famous of the global film, fashion and media businesses. That evening around 100 students huddled against the door, uncertain what to do. 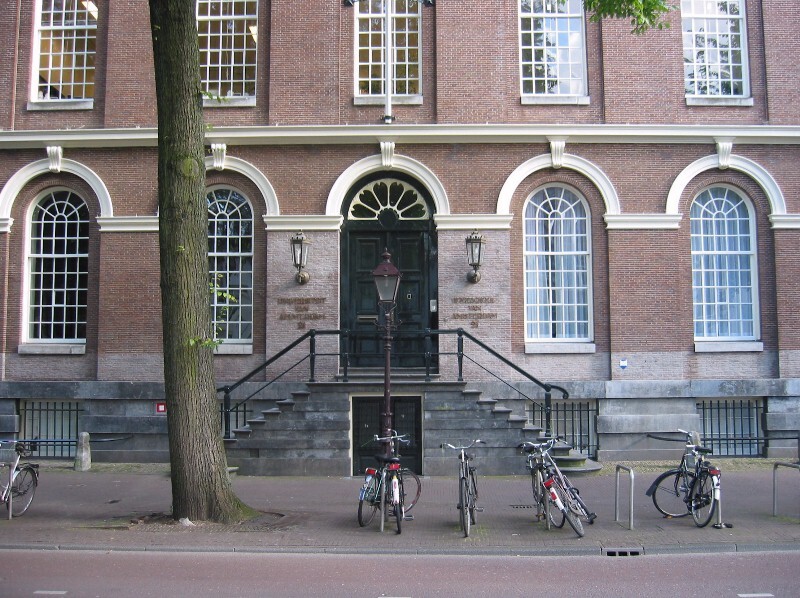 Suddenly the main entrance gave way, granting them access to the cavernous hallway of the building, locally known as the “Maagdenhuis” (literally “Virgin House”)–a late 18th century building which used to house a Catholic church-run facility for orphaned girls, hence the name. More important is its iconic role in the 1968 student protests, which initiated a broader societal “liberation” from stifling post-war morals and values, when the building served as the nerve centre of the movement. Luckily, the five security guards inside chose to desist rather than resist and merely ensured that the students were unable to enter the office spaces located at the first and second floors. Despite the exchange of some harsh words and a broken glass door, the occupation developed mostly peacefully and without any random acts of vandalism. A couple of hours later the visibly shell-shocked Executive Board of the University arrived, with their full retinue in tow, including drivers, security guards and others. The chairwoman of the Board, a long-serving member of the Dutch ruling elite, made the mistake of demanding in a shrill voice that the students immediately leave “her” building. It was the Board’s second publicity mistake, after obtaining one week earlier a legal injunction, to the ridiculous tune of 100,000 euro, against each student that stayed inside the first building that was occupied. Sidelined by the students who had quickly adopted the collective decision-making procedures developed by the occupants of New York’s Zuccotti Park in September 2011, the Board was left to stew in their own rage and frustration. That same evening the mayor of Amsterdam was called from his bed to negotiate with the students, after they had renounced their trust in the Executive Board of the University. Two weeks later: what had started as a student protest against cutbacks of ten percent of the budget of the humanities–resulting in forced lay-offs, the closure of some smaller disciplines, and perhaps a complete overhaul of humanities programs–has now developed into a broad-based attack against the hegemony of new public management (“profit maximization”) in Dutch public services which is widely seen to be responsible for taking the “soul” out of them and transforming universities from institutes for higher education and learning into large, for-profit corporations which specialize in real estate development, speculation and management. The occupation seems to have awoken staff as well as citizens from their political slumber. The academic community in Amsterdam is now a veritable beehive of activities, groups and committees, which, Occupy-style, issue demands to the Executive Board of the University and, together with students, has proven to be utterly creative in backing this up with witty forms of protest. In the Netherlands more widely the tide also seems to have turned. While initially there were still quite a number of voices to be heard on social media and in the mainstream that were poking fun at so-called “elite” students defending their own privileges, a recent survey among Dutch citizens indicated that a large majority now backs the staff and students and is in favour of a more democratic, less managerial university. Even more telling was an editorial in the largest right-wing populist tabloid of the Netherlands, De Telegraaf, backing the staff and students in their fight against new public management and urgently calling for a stop to managerialism in public services. While at the moment of writing it is unclear how this will play out (the Executive Board of the University has just published a reply to the demands of staff and students which, while submitted more than 26 hours after the deadline, at first sight looks constructive and promising–see here), it is obvious that whatever the outcome at least the University of Amsterdam will have become a different place from the one that it was before the occupation of the Maagdenhuis. The extent of organizational change is, as always, dependent on the determination of students and staff to maintain momentum. The creation of new political events is hence crucial to keep the initiative alive. The occupants of the Maagdenhuis have done their utmost to move this process forward by coming up with wonderful programs of speeches, training sessions, lectures as well as concerts in the main hall. Last Saturday, for example, David Graeber, the well-known ideologue of the Occupy movement, flew over to Amsterdam to do a two-hour sit-in with the students, which, as can easily be imagined, strongly fortified their spirit. Reblogged this on toxic geographies. Reblogged this on Sol Gamsu. Reblogged this on Path to the Possible. Excellent piece, to which I would add just one correction: Zuccotti was part of a long chain of movements in 2011, and in fact the U.S. was very late to the party, following Cairo, Athens, Madrid, Tel Aviv, and others. Occupy definitely did not “develop” the decision-making procedures used in Amsterdam, and in fact they were directly copying the Athenians and the indignados, who were themselves heir to the long legacy of such practices stretching back, most immediately at least, to the 1960s. The American Occupy movements often get narrated as having *initiated* this new wave of protest, but they were in fact very much following in others’ footsteps. After a period of constructive negotiations, the confrontation between students and staff on the one hand and the Executive Board on the other hand of the University of Amsterdam has escalated this weekend. On 11th April the Amsterdam Police brutally evicted the occupants of the Maagdenhuis, the central administration building of the University of Amsterdam. Students have been occupying it since February in protest against the undemocratic character of the university management, ruthless austerity and financialization of higher education in the Netherlands. The students initiated this occupation, but they were very soon supported by the staff and a large section of the public opinion, including trades unions and some Dutch MEPs of several parties (including one of the coalition parties). They organized an “open” occupation, that we have called “re-appropriation” since the building was closed to rank and file members of the academic community for long. It was used for with lectures, public discussions, democratic assemblies on how to proceed, concerts, etc. Nobody has ever been prevented from entering the building. The students occupied it and held regular “cleaning sessions” to keep the building tidy. 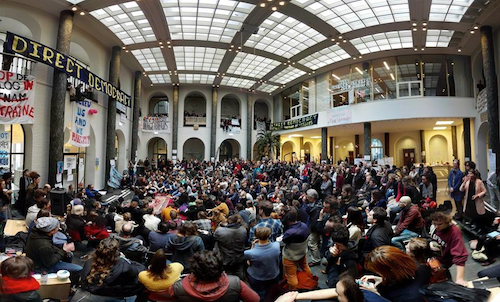 Activists and academics from all over the world showed their solidarity: David Harvey, John Galtung, Judith Butler, Saskia Sassen, Noam Chomsky… Some of them visited the Maagdenhuis, gave public lectures and joined open discussions, such as David Graeber, Ewald Engelen and Jacques Rancière. The movement has also decentralized in grassroots working groups in most faculties to rethink the university in the different faculties and departments (and similar groups emerged in other Dutch universities).The trade union FNV has been particularly involved linking I with their cleaners branch and the security branch and with other public sectors confronted with the same neoliberal bureaucratization and taylorization (especially the health sector). And the Board agreed for the nomination of two formal committees to scrutinize the financial situation and the governance structure of the university. The two committees will be jointly nominated by the board, the workers council (we do not have representation as academics but as workers like any other firm) the students council as well as the two grassroots organization De Nieuwe Universiteit (= The new university) (the students) and the Rethink UvA (the staff). Although the students’ original demands were hardly met by the Board, the students agreed to leave the Maagdenhuis on Monday April 13, as they would continue their struggle for democracy with other means. This weekend the students wanted to conclude the occupation with a “Festival of Science and Humanities.” Many colleagues were scheduled to give lectures at this occasion. This was also the start of a big discussion about the role of the university in society. However, the Board decided to take legal action against students and staff, having them evicted by the police, while they knew the Maagdenhuis would have been vacated two days later. This escalation is a disgrace. It came with the criminalization of the students. Although the students left peacefully the building at the arrival of the riot police, several people have been arrested in the public space where some kind of festival was improvised in front of the building. Dutch laws allow to stay anonymous, but the police has now sent five of them to foreign detention (the detention centre to wait for deportation) assuming they were “illegal” aliens. The idea is that people give their identity to get out of there. This is a procedure that has been used to intimidate squatters in the past – and condemned by the Raad van State – the highest court, but nonetheless. The disruption of a peaceful academic festival is an unacceptable show of power from the CvB. The small amount of trust that was painstakingly rebuilt over the past weeks (after the eviction of Bungehuis) has now again been completely crushed. Many of us consider the unnecessary escalation and excessive escalation of force the CvB’s responsibility. The University of Amsterdam Board of Directors and especially its president Louise Gunning have lost any remaining legitimacy. They should resign, stop prosecuting their students and staff and organize elections for a new Board that will carry out democratic reforms. An open letter with 300+ signatories from the professors, teachers and researchers has been published yesterday in the national dailies NRC Next and NRC Handelsblad (the most conservative of the quality newspapers by the way) and a large demonstration of staff and students was organized yesterday to demand the resignation of the board to allow for the contuantion of the reform movement sent in motion over the past few weeks. Both attracted plenty of media attention and allowed for the alleviate for the criminalization of the students in the media over the weekend (including a fantasmatic claim of the board for half million euro damage to the building in court). Please check at http://www.rethinkuva.org for the news from the agitating staff and associated twitter and facebook accounts. The site is mostly in English. I’ll be at the AAG Annual Meeting next week (with a few other UvA Rethinkers and colleagues) and hope to have the opportunity to meet others involved in similar movements past, present and of course future ones. I have not had time to study the programme yet, but I am sure there will be somewhere some sessions organized by colleagues from York, Toronto, the London School of Exploitation and many other places where similar attempts are made to roll back the entrepreneurial university. Apologies for the long email – again. 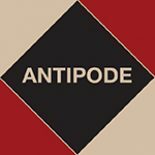 This entry was posted on 11 March 2015 by Antipode Editorial Office in Video Abstracts and tagged 1968, austerity, Dutch higher education, financialization, humanities education, Maagdenhuis, managerialism, neoliberal universities, Netherlands, new public management, occupation, occupy, student protest, the university, Universiteit van Amsterdam, University of Amsterdam.